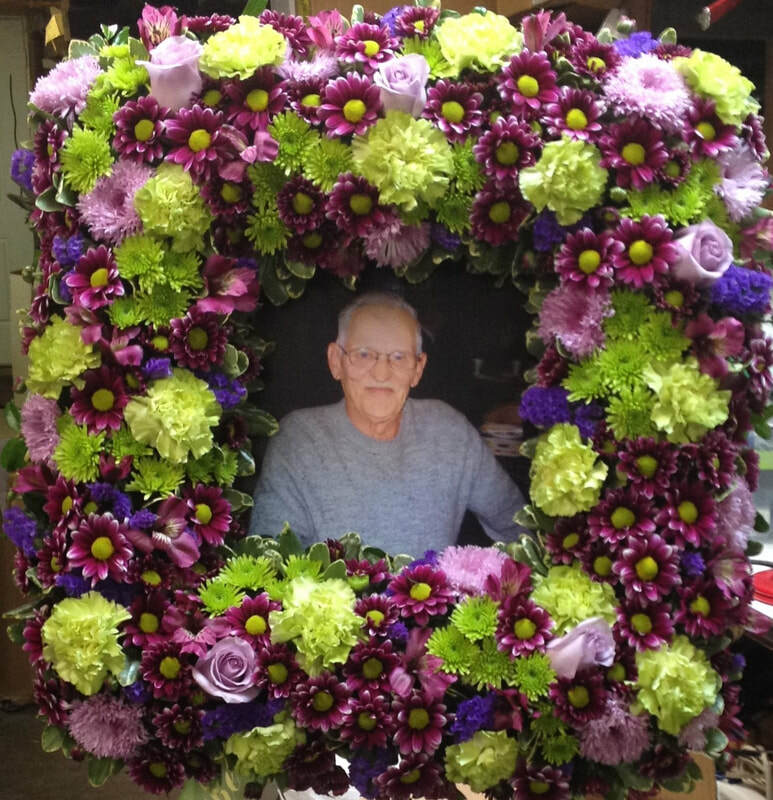 This arrangement was done for a man who was an avid painter. 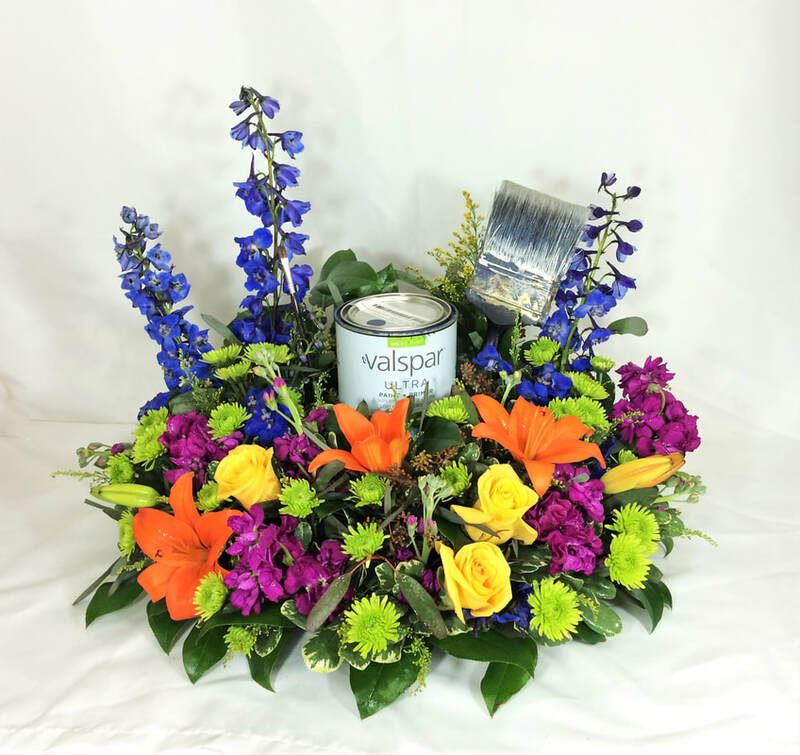 Bright mixed color flowers, including blue delphinium, orange lilies, yellow roses, green athos mums & purple stock, all arranged around a paint can & well worn brush. A wicker basket of mixed wildflowers, including stargazer lilies, white alstroemeria, pink matsumoto asters, purple carnations, status, and more. 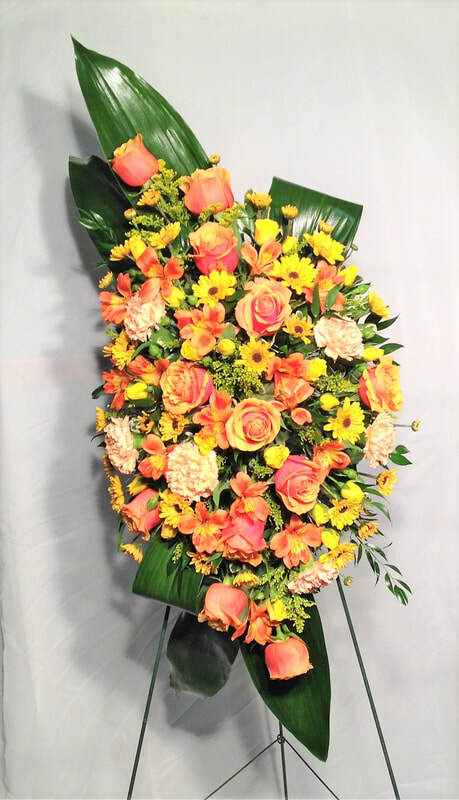 A tropical looking easel spray, featuring cherry brandy roses, yellow viking mums, orange alstroemeria, solidago, and peach carnations. 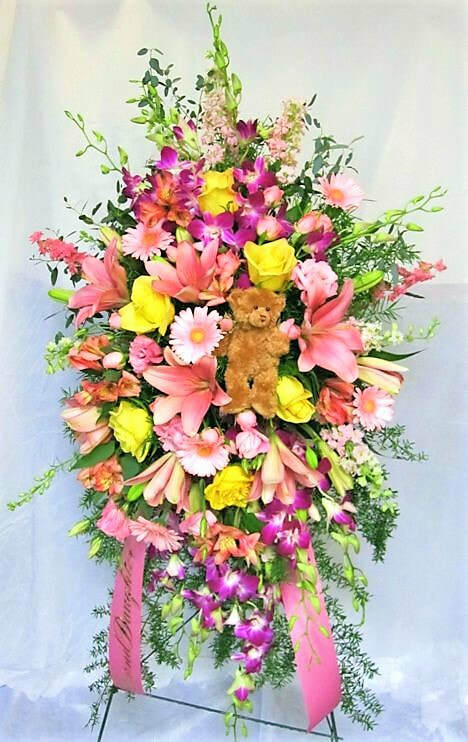 An easel spray in delicate feminine colors, with orchids, lilies, roses, gerbera daisies, alstroemeria, and larkspur, and accented with a small plush bear for the service of a young girl. 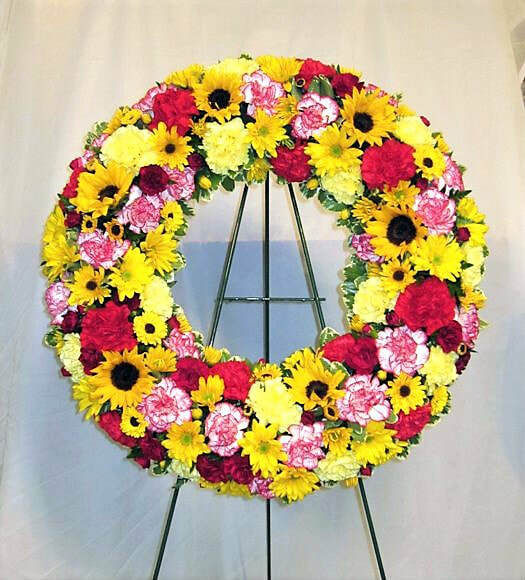 A memorial wreath in fallish masculine hues, featuring sunflowers, viking poms, daisies, and carnations. 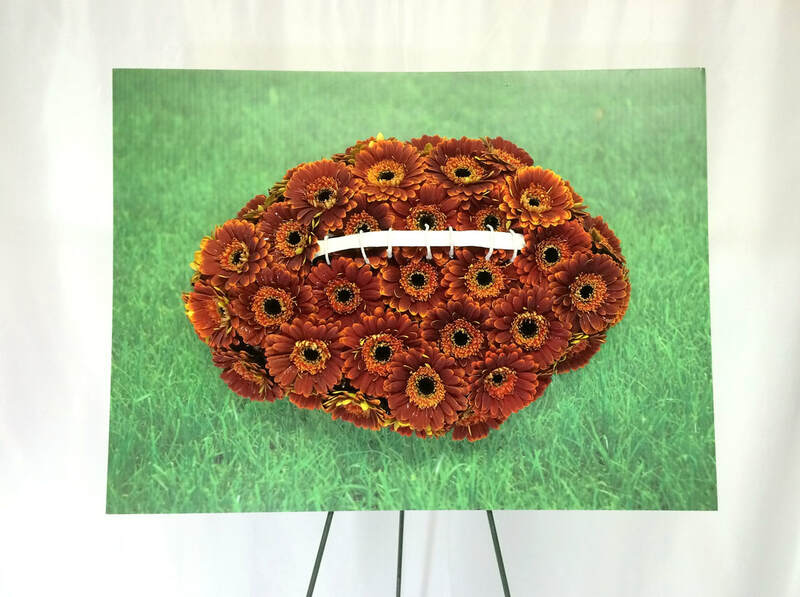 A football, made out of gerbera daisies, and displayed on an easel for a service of a beloved coach. 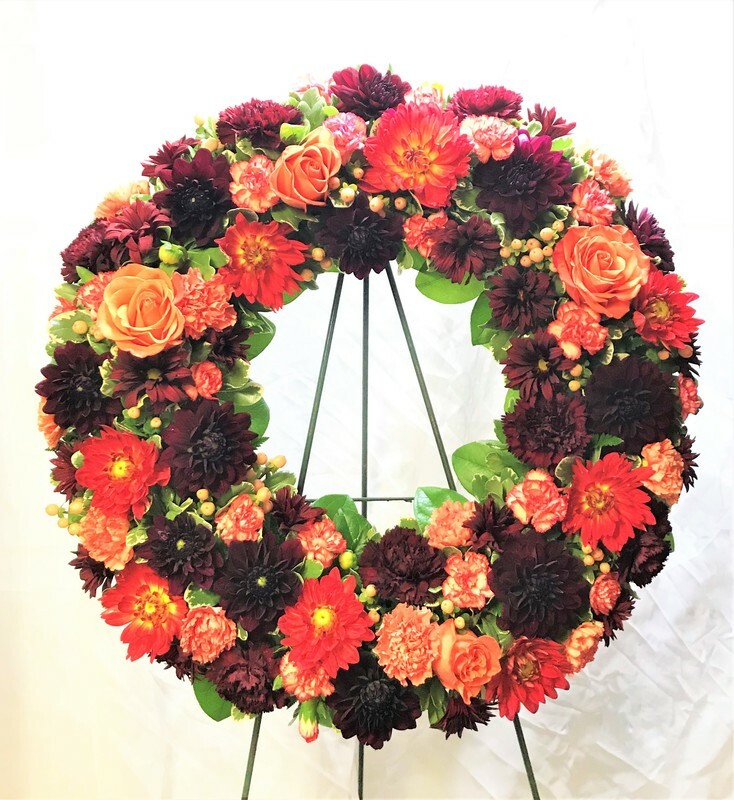 An elegant memorial wreath in orange and maroon, made of dahlias, roses, carnations and hypericum. 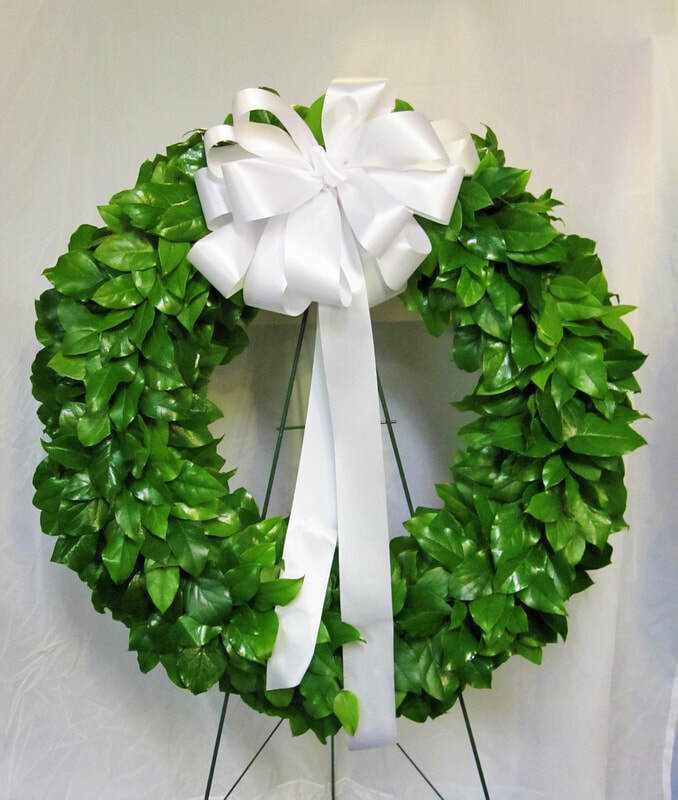 A memorial wreath made of lush green salal leaves, accented with a simple white bow. 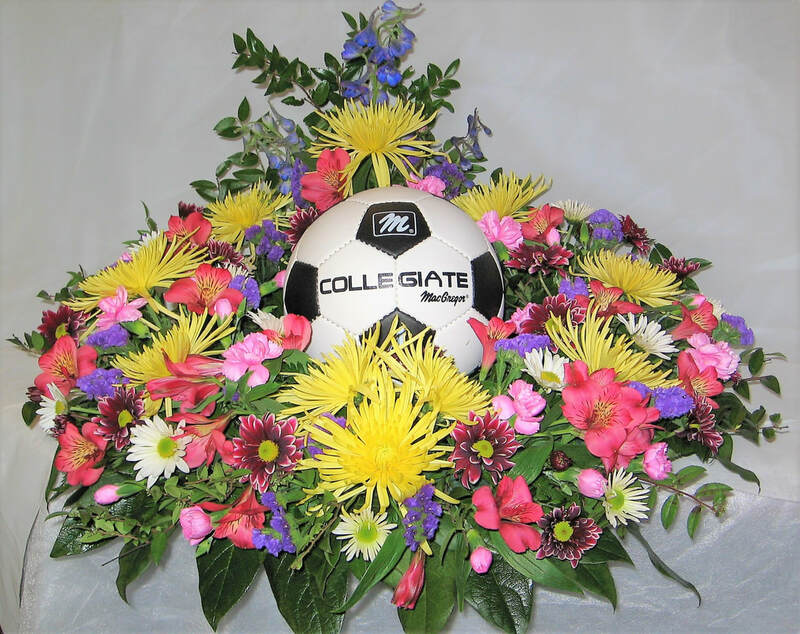 A memorial bouquet for a young woman who loved soccer. 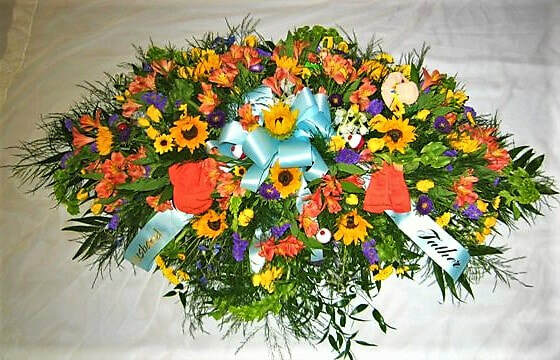 The arrangement features yellow fugi mums, hot pink alstroemeria, blue delphinium, and assorted color daisies surrounding a soccer ball. 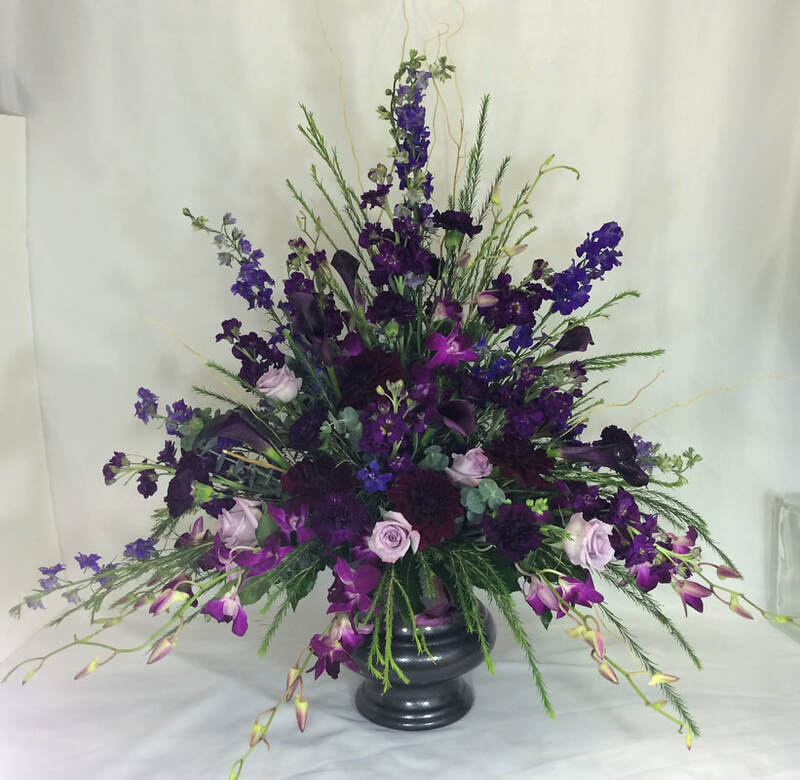 This funeral bouquet features a mix of all purple flowers, including orchids, roses, larkspur and more, in a charcoal urn. 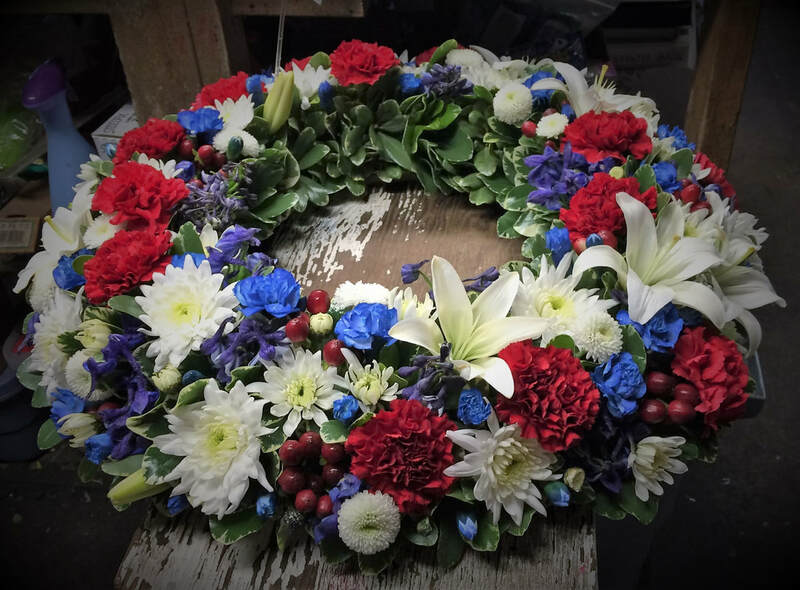 A pretty patriotic urn ring for a veteran featuring red carnations, hypericum berries, blue mini carnations, and delphinium, and white lilies, and assorted mums. 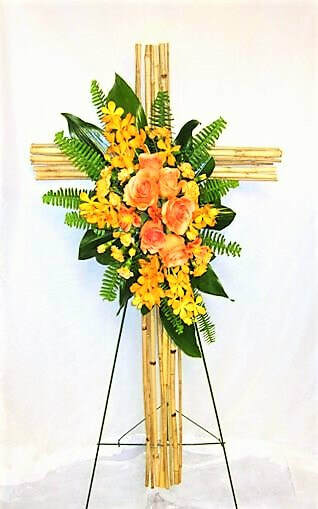 This bamboo cross easel spray is adorned with tropical foliage and beautiful orange orchids, alstroemeria, carnations and roses. 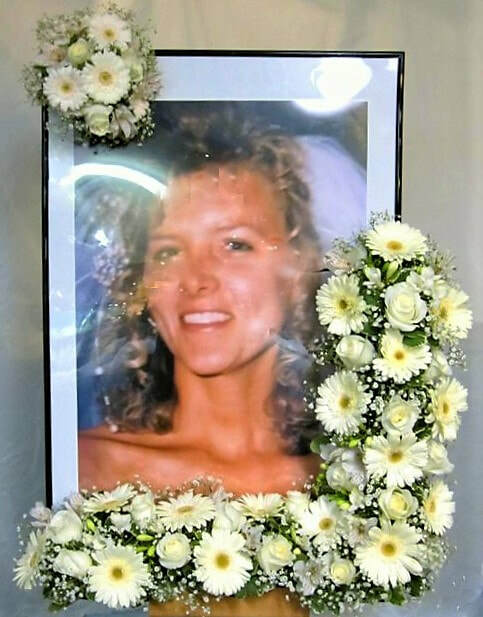 White gerbera daisies, roses, alstroemeria and babies breath were used to create two accent pieces to adorn a large portrait the family planned to display at the service. 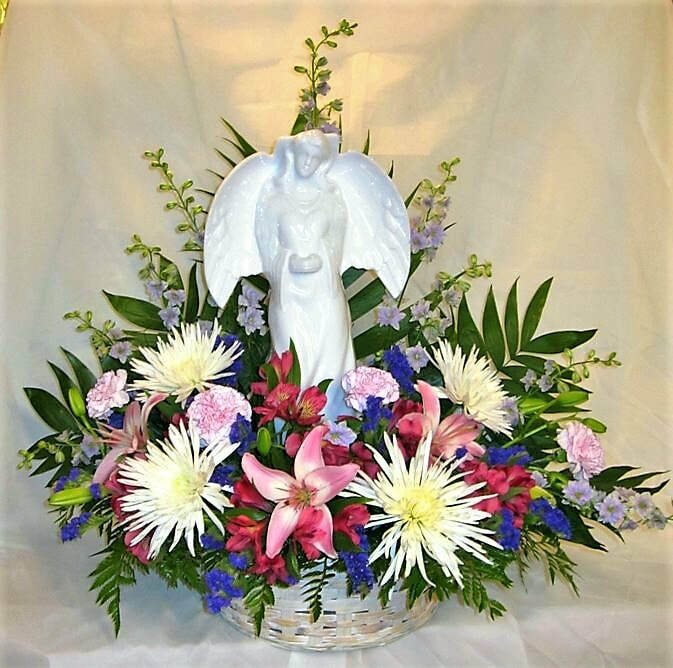 This basket arrangement features a beautiful solar angel figurine, which can be placed outdoors - at the grave site, in a memorial garden, or wherever you choose - where it stores solar energy during the day, so it glows at night. 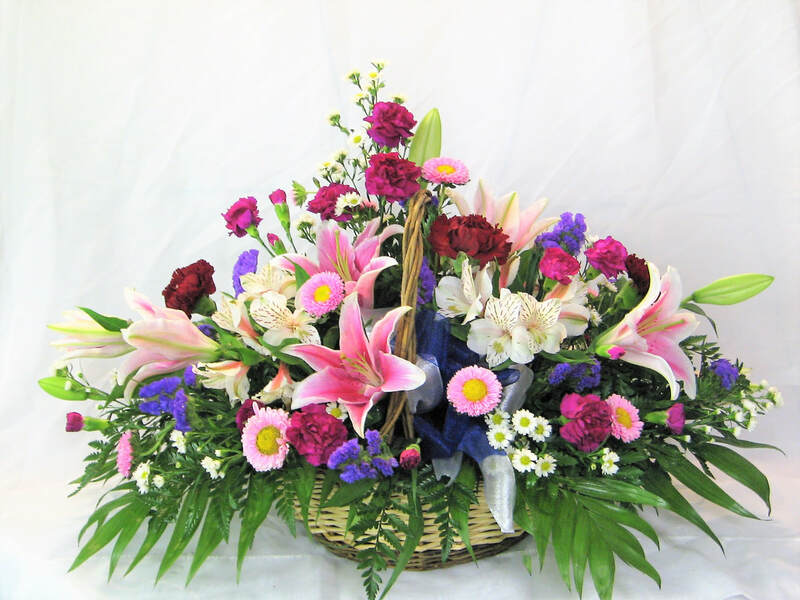 It is surrounded in this bouquet by white fugi mums, larkspur, pink lilies, carnations, alstroemeria, and purple status. 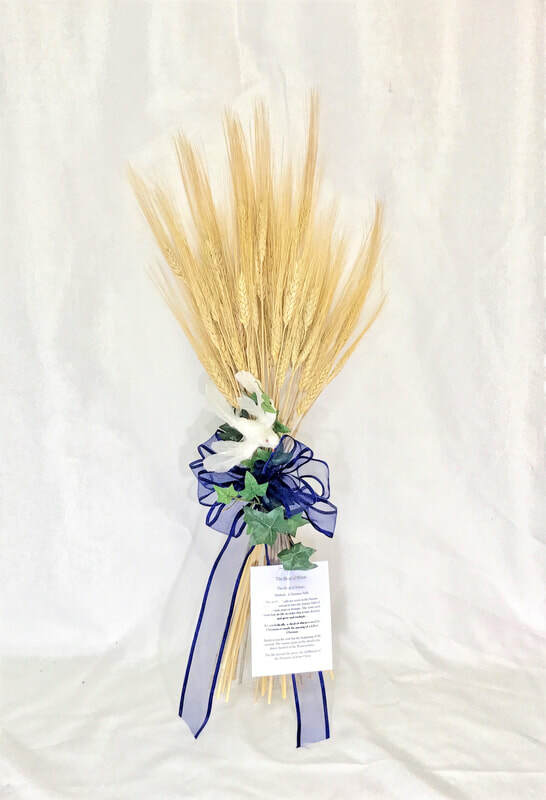 A decorative Sheaf of Wheat, decorated with a dove, bow, sprig of ivy, and a note explaining the symbolism of the sheaf. A memorial arrangement for a man who loved wildlife & the outdoors. 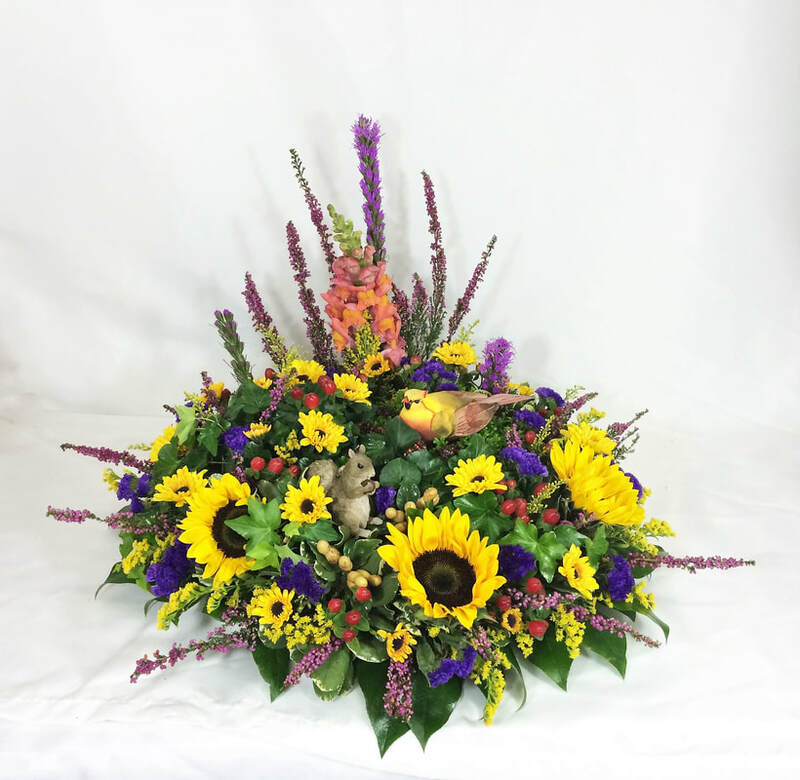 Bright yellow sunflowers, viking poms, purple liatrus, and other assorted wildflowers surround a decorative squirrel and bird. 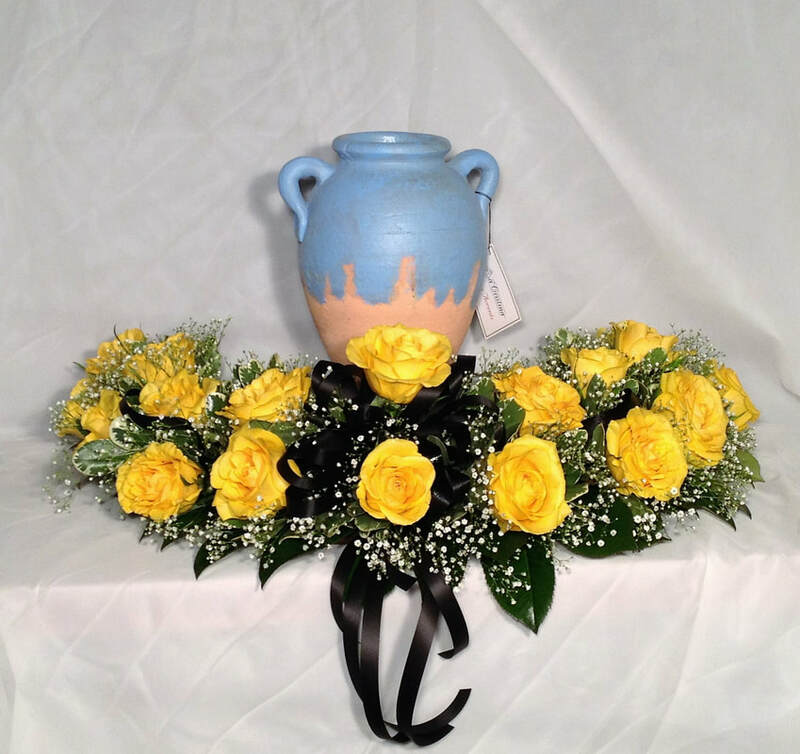 An urn ring made of yellow roses and babies breath, and accented with a black bow. 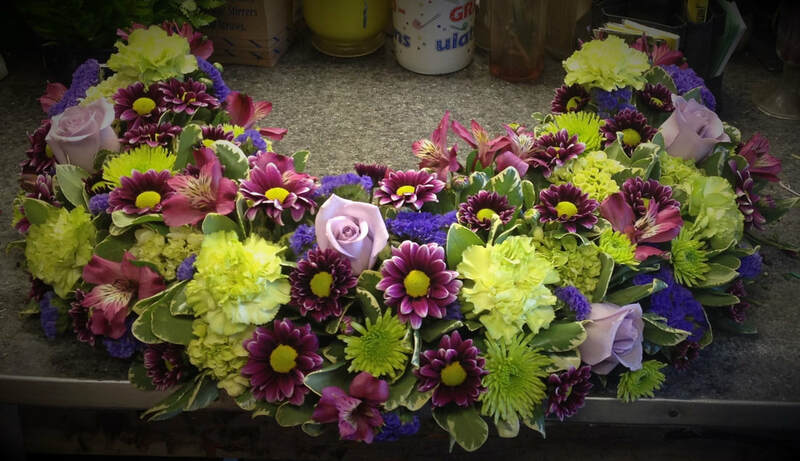 This square frame floral wreath, made of lavender roses, green carnations, lavender mums, purple daisies, and green athos mums, nicely holds a photo of a departed loved one. 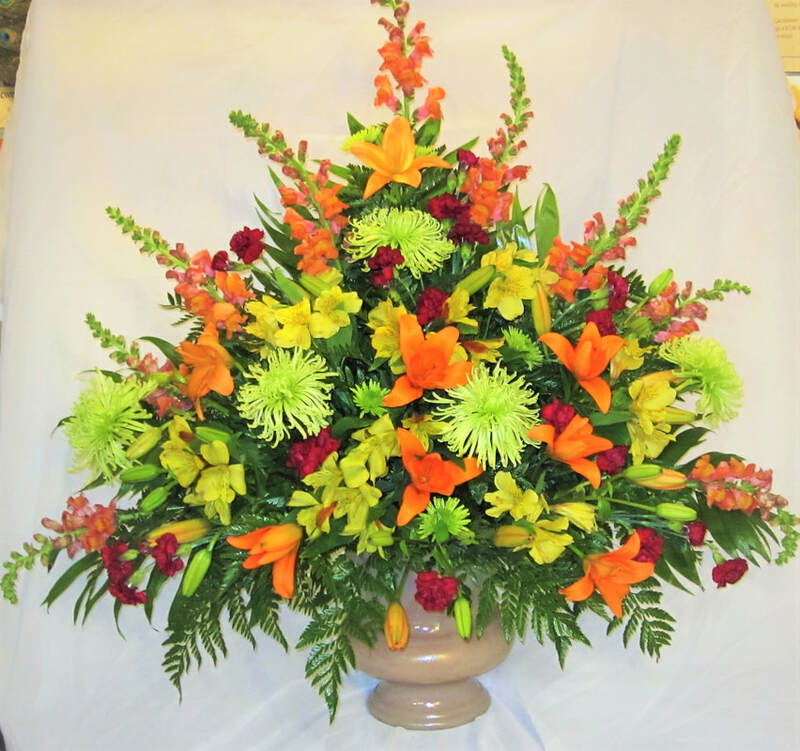 A typical funeral arrangement in citrus tones, with orange lilies, green mums, and yellow alstroemeria. 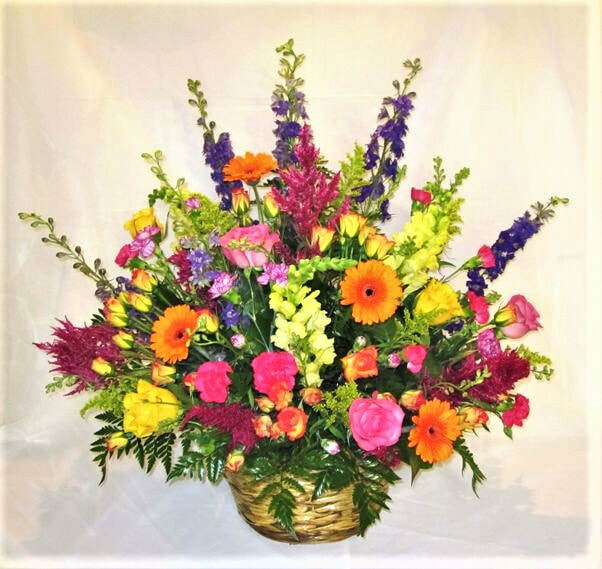 This wildflower basket, featuring an assortment of flowers in an entire rainbow of colors, is the prefect table arrangement a family can take home & cherish after the service is over. 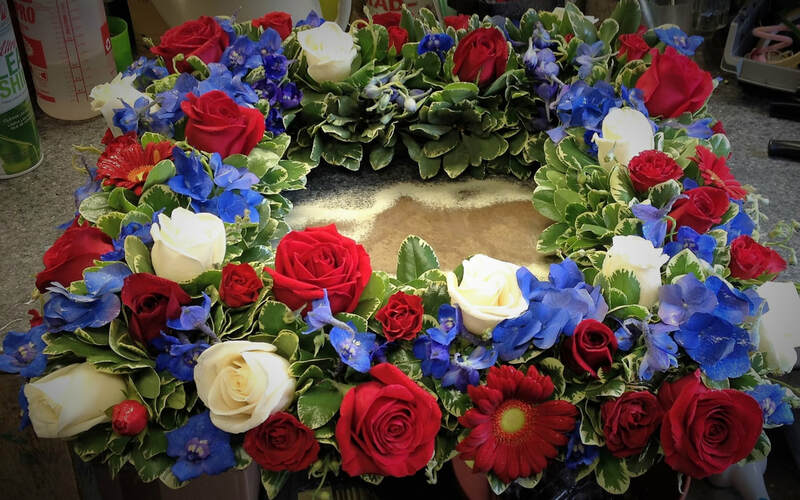 A square red, white & blue urn ring with roses, gerbera daisies, and delphinium. 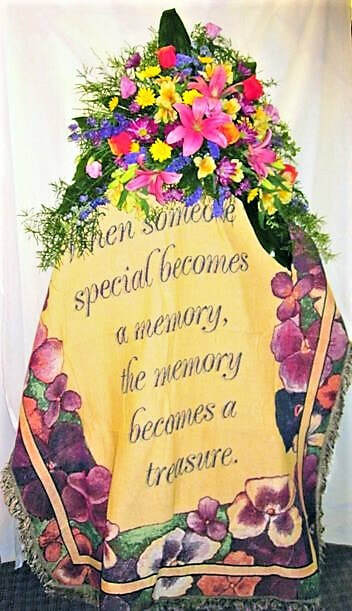 This arrangement, of pink lilies, yellow daisies, cherry brandy roses, and purple status, serves as an accent to a memorial blanket the family will be able to take home & cherish for years to come. 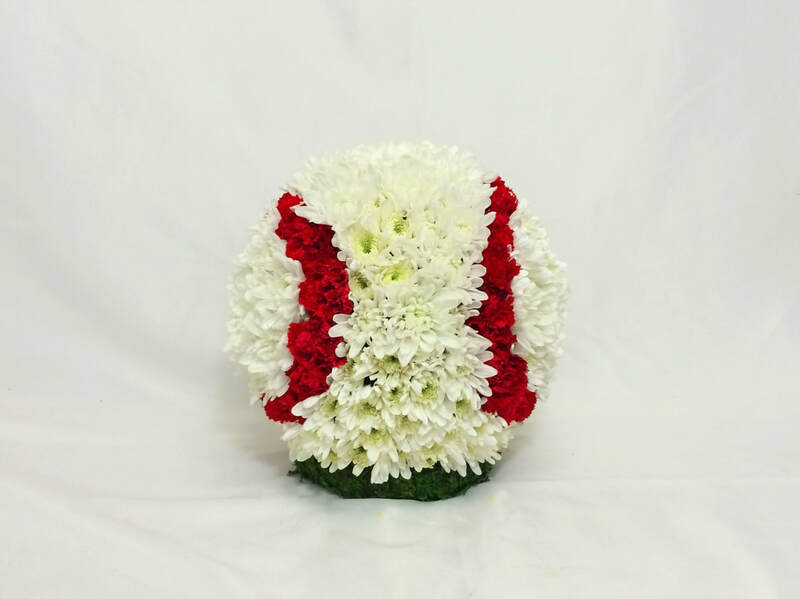 This 360 degree baseball is made of white mums, with red mini carnations for stitching, and sits atop a grassy base, for the funeral of a baseball enthusiast.